ROME, May 31 (IPS) – On June 5th, World Environment Day will be hosted in India under the banner of “Beat Plastic Pollution,” aiming to raise awareness and civic engagement alongside creating a global movement to reduce the amount of plastic in the environment. World Environment Day addresses four main campaigns. First, it seeks to decrease the amount of single-use plastic items. Second, it will try to improve plastic waste management, since plastic takes hundreds of years to degrade, poisoning the soil and even getting into the food we eat. Third, it aims to phase out microplastics because recent studies show that 90 percent of bottled water and 83 percent of tap water contain plastic particles which affect blood, stomach and lungs. Finally, this global platform intends to coordinate further research in order to create alternatives to plastic. As synthetic polymers can be transformed into cheap, lightweight and durable products, demand for plastic is growing worldwide, rising from 5 million tons in the 1950s to over 300 million tons in 2017. The UN has estimated that more than 5 trillion plastic bags are consumed annually while 17 million barrels of oil are used to produce plastic. At the same time, 50 percent of this plastic is for single-time use, making the share of plastic in human-generated waste 10 percent. The problem is intensified by the fact that every year, 13 million tons of plastic get into the ocean killing 100,000 marine animals. 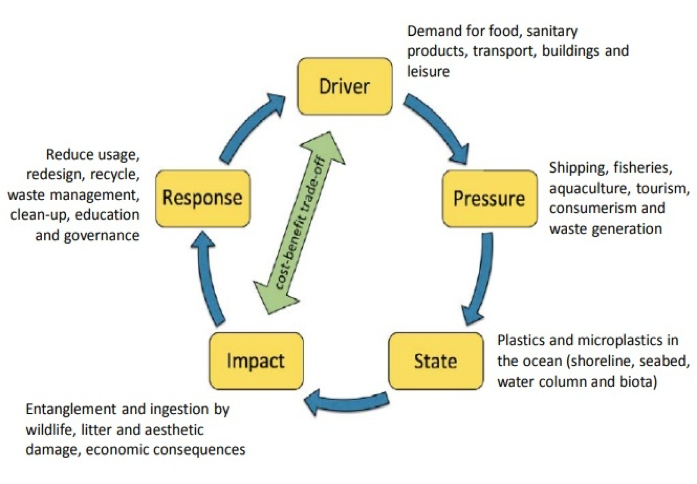 In his report, Future of the Sea: Plastic Pollution, Professor Richard C. Thompson describes human plastic consumption through the “Driver-Pressure-State-Impact-Response (DPSIR) framework”. The DPSIR framework in relation to inputs and impacts of plastics and microplastics in the marine environment. Modified from original by P. J. Kershaw (UNEP 2016). According to Professor Thompson, the driver which leads to the highest amount of litter is the demand for plastic production. Intensive fisheries and shipping, alongside increased tourism and consumerism overload waste management, lead to the ineffective waste treatment that contributes to plastic pollution. Professor Thompson suggests reduction of plastic usage, effective clean up and waste management, recycling, education of society and good governance. Plastic pollution affects oceans the most. Professor Thompson says that around 70 percent of litter in the ocean is plastic. The major part of this litter in the oceans originates from land pollution as plastic gets into the rivers and finds its way to the oceans. This problem has negative consequences for marine organisms, leading to their death and even extinction. Ocean pollution also decreases the value of coastlines, necessitating costly ongoing clean-up operations. The team of US and Australian researchers led by Jenna Jambeck, an environmental engineer at the University of Georgia, listed countries which pollute oceans with plastic waste the most. According to their results, China and Indonesia are the leading countries responsible for plastic pollution of global sea lanes. As a 2010 report from The Wall Street Journal estimates, together, both China and Indonesia are the source of more than a third of plastic litter into the global waters. 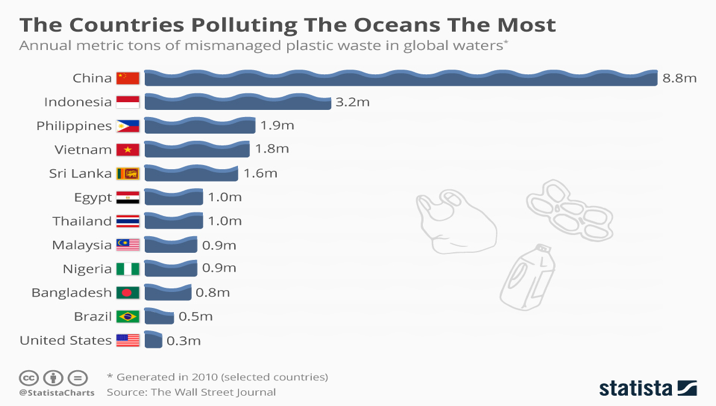 From the graph, it is possible to conclude that majority of mismanaged plastic waste in the oceans is tracked back to Asian countries, many of them developing states with poor recycling and waste management systems. Even though the exact quantity of plastic waste in the environment is unknown, it is certain that without any action, quantity of plastic waste alongside its horrific impacts will continue to grow. It has been estimated that in the next eight years, the quantity of plastic items produced will equal the amount of plastic produced in the whole twentieth century. Fortunately, an increasing number of individuals avoid consuming single-use plastic items and volunteer to clean the environment. However, individual action alone is not enough to solve this global problem. As the source of the problem lies in “manufacturing, distribution, consumption and trade systems for plastic,” the whole “global economy needs to change”. 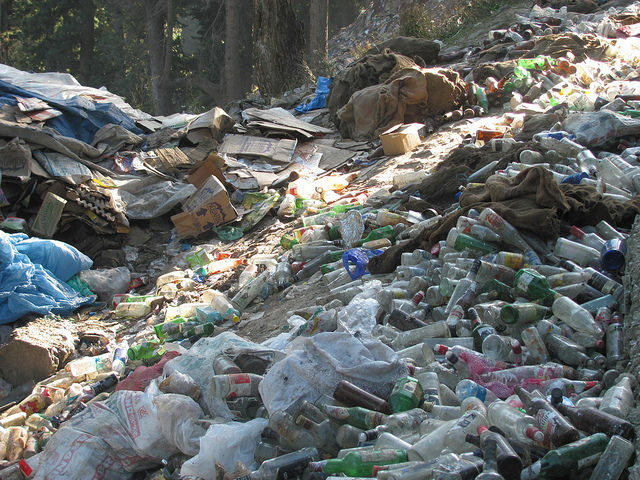 Subsequently, active involvement of governments who will implement competent legislation regarding production and management of plastic items is needed.